Smooth primer all over face with fingertips. Use alone or under makeup as a primer. 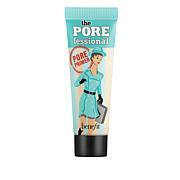 I have been using the Benefit Porefessional Primer for years now, but the new Pearl version works much better with my skin type, and skin tone. I love the added radiance it provides. Love love love. I do not use foundation,thank you Perlier, however, I do use under eye cover and this product helps make it go on smother and I don't need very much cover-up because this seems to make the cover-up work better. Love it!!!! This is so hydrating and smooth on the skin I love it! I use this everyday and it makes my skin smooth & soft. I just love this product-not only does it blur and almost totally obliterate the look of large pores on and around my nose but the glow it provides keeps my face from being that stark matte most pore products produce.I hope this product never is discontinued-what it does for the appearance of my skin is amazing!